"Guerrilla art" refers to pieces performed or displayed in public places and is a trend picking up steam on campus. Travis Amiel, a junior performing arts major, directed a piece in the Iwasaki library as part of the Rogue Theatre Festival. Sitting cross legged on what is meant to be a table in the Max Cafe, junior performing arts major Travis Amiel, explains how using non-traditional theater space enhances creativity. Guerrilla art—pieces performed or displayed in public spaces—has been happening on Emerson College’s campus. During Veteran’s Day weekend earlier this month, Amiel directed one such piece in the Rogue Theatre Festival, a program to showcase performance pieces created by students. The festival consisted of eight shows, taking place in different “found spaces” in and around campus, according to the events program. 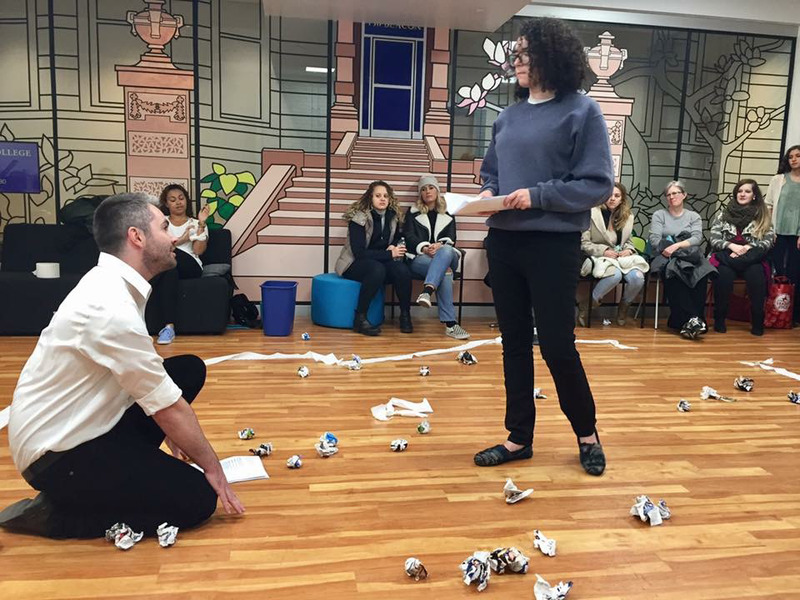 Amiel’s short play was performed in the library and included audience participation. “The library as a place of learning and exploration, felt conceptually relevant,” Amiel said. His performance was based off the epic play Tamburlaine by Christopher Marlowe, taking an excerpt and making cuts to create a performance with original elements. Amiel cited lack of formal theater constraints as the reason those at his performance were willing to jump in when prompted. During a fight sequence, audience members were asked to throw crumpled paper at each other. Guerrilla art, according to Amiel, generally lifts certain constraints that weigh down a traditional play. The festival is the brainchild of Sarah Harmer, a second-year theater education grad student. She said she learned to broaden her definition of a theater space as an undergraduate at the National Theater Institute. “It was like, ‘Okay here’s the deal—you're going to use everything but a theater, [just] taking on the space and using it for what it is, and using our voices, our minds and collaborating,’” Harmer said. She said she decided to organize the festival with the help of her peers, both graduate and undergraduate students. In an effort to leave room to continue the festival in future years, Harmer said she tried to be conscientious of the rules on campus when organizing the rogue performances. She let security know that people outside the Emerson community would come to the performances, and made sure they left spaces in better condition than they were found, Harmer said. The process of organizing the festival began when the Theatre Education Graduate Association, or TEGA, accepted Harmer’s idea as a fall show for 2016. Harmer said she was unable to request permission to perform in some of the public spaces that they used, because she did not know who or how to ask. Harmer said her philosophy when organizing the event is that sometimes, it’s easier to ask for forgiveness than permission. “It’s hard to plan fully what will happen, because so much of it is what will happen in the moment, and adjust from there,” Harmer said. Harmer’s biggest takeaway of her experience with guerrilla art is that you do not need a lot of material things to stage a successful performance. Neil Spellman, the account manager for Securitas at Emerson, worked with Harmer and the other students to ensure that the festival complied with the college’s security policies. “I understand the importance of our guaranteed right of free speech. I will continue to support [those] rights within any restrictions set up by Emerson,” Spellman said. Spellman reflects on the history of guerrilla art throughout the city as a reason to support that same artistic movement on campus. Assuming, of course, the organizers work with and abide by the regulations laid out by the security personnel, Spellman said. Harmer said she wasn’t worried about Emerson’s willingness to work with students on their artistic efforts. She credits the open flow of communication among Emerson community members, students and faculty alike, with the success of the Rogue Theatre Festival. Amiel said he hoped Emerson College personnel would not interrupt the expression of art on campus unless absolutely necessary. “My hope is just that the answer would never be, ‘No, you can’t do that,’ and if the answer is no, there should be a really good reason,” Amiel said.